bobbleheads are among the most amazing toys in human history. It is believed that the first set was manufactured in Germany around 1920s and became famous quite around the 1960s. They were primarily for sports. Today, they are quite popular for sports, entertainment as well as for cartoon characters. The most common thing about them is that they were not quite personlized before as some of them are now. While they were made for each team, they had the same and face and only the uniforms were different. The bobbleheads were a bit popular in the late 1960s before they became quite unpopular in the mid 1970s. At this time, however, the most popular ones were those for the Beatles and the baseball team. When they disappeared and became quite less popular, the two remained to be the most sought after bobblehead dolls in history at the time. The bobbleheads actually returned to prominence after 20 years. You already know that bobbleheads like the Beatles were popular at the time despite situation. However, the new ones were quite rare and and far between. They later came to “being” due to their cheaper manufacturing process and and the change of the material from ceramic to plastic. It became possible to make limited numbers necessary to make them viable collectibles. Three materials have been used in the history of custom bobbleheads. The very first material to be used was the papier-mache. The material had a problem with chipping and cracking and so was changed to ceramic. A few year later, there was a change from ceramic material to the use of plastic in the manufacture of bobbleheads. This is what made it possible to manufacture them easily and at low costs. 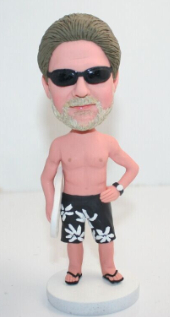 This entry was posted in Custom bobbleheads on January 31, 2015 by admin. Do bobbleheads Still Have Their Place Reall? History has it that the first Bobbe heads, called the Nodders, first appeared in Germany, in the late 1960s. These were large figures of animals about 6 to 8 feet tall. 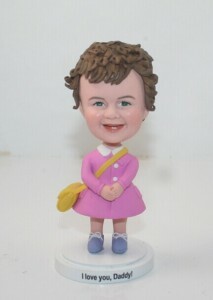 Some people believe that quite a number of bobbleheads existed even before 1960s but were not quite popular at the time. Japan was on the lead, in 1970s, in the manufacture of four common bobbleheads, which became quite common in history of the time. The main material Japan used to make the bobbleheads is papier-mache. Now, papier-mache is not quite good for making the bobbleheads, and this explains why bobbleheads made using this material are few in number. According to the records present, the few of the papier-mache bobblehead dolls that survived either had cracks or chipping or both on them. At the time, there was nothing such as personalized bobbleheads. They were made for baseball teams and each team had its own type. The bobbleheads made had the same face but wore different types of uniforms. You should take this to mean that there were no bobbleheads for individual players. This is why all those early bobbleheads had the same head, even though they were in different uniforms. History has it that the most popular bobbleheads were The baseball bobblehead and The Beatles bobblehead dolls. In fact, they remained the most sought after, soon after the bobbleheads became less popular. There was a change in the material used in making the bobblehead dolls. Ceramic was adopted in place of papier-mache and have been used in the production of the item for a long time now. The Beatles and the Baseball bobbleheads are still popular to date and some have been personalized for tournaments, sports as well as cartoon characters. This entry was posted in Custom bobbleheads on January 27, 2015 by admin. The very earliest reference to Bobbleheads is the Nikolai Gogol’s “The Overcoat” story, which describes the neck appearance of the character. Actually, most of the bobbleheads you see around today first appeared in the 1950s. Ten years later, quite a number of bobbleheads had already been produced. The Major League Baseball was the one on the forefront on the initiative of manufacturing the papier-mache doll for each team. Each bobblehead had the same cherubic face but in different uniforms. But bobbleheads would not be just good if done in papier-mache. The material that was once known as the best in the manufacture of bobblehead was actually not just a good enough solution for the make. Research on the papier-mache bobbleheads reveals that only a handful of them do exist. They are not in good conditions. The few that survived either have crackings or chippings on them or both. In fact, they became less popular among the North Americans, soon after the onset of 1970s. The switch in the material that would be used in the making of the bobbleheads actually changes shortly after ten years. Ceramic would be used in place of papier-mache instead. This led to the production of bobbleheads for other sports as well as cartoon characters. The Beatles is the most famous bobblehead there is today in the history of bobbleheads. This one has lived to become the most valuable collectible we have to day. The popularity of most of the bobbleheads was winding down after 1970s though. And this was not just in the North America but in the United States, Germany and other parts of the world where they have ever made history. Even at the time when the popularity of bobbleheads winded down, the most popular ones like the Beatles and the Baseball team were still the most sought after. This entry was posted in Custom bobbleheads on January 24, 2015 by admin. With bobbleheads doing round in commercial stores, it is possible that you will so slightly brush off the idea of acquiring one without a second though. A just question to ask is whether custom bobbleheads are worth the attention and raging debate that they are accorded and so here is a simple insight into uses a bobblehead can be put to. bobbleheads are more of representative figures of what you like or value. For whatever thing that is the love of your life bobbleheads provide a humble way to pass the message and see what you like most. You may be a military man with the love of war heroes, an environmentalist who has a soft spot for dogs or any other niche. bobbleheads will depict your love in a way that is entertaining and interesting; have a picture of a renowned warrior or your favorite pet among other things. 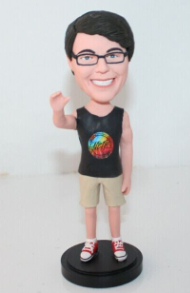 Custom bobbleheads are further a rich source of gifts. One may choose to have a bobblehead representing the love of his friend or colleague then unravel it up as a gift on a special occasion. Many of us love gifts and we love it more when we receive gifts that are unique and trendy. There are bobbleheads that depict different themes. Some may be adopted depending on need. Such bobbleheads are suitable for different settings including offices and the choice will depend on what they need. This entry was posted in Custom bobbleheads on January 21, 2015 by admin. Everyone would like to have something that reminds them of a particular occasion. That is why photography and painting have remained relevant all along despite decades of their practice. But what if you could make your nostalgia even more intense by doing things in a different manner? One way of achieving this is going for bobbleheads. A unique and exquisite class of art, these collectibles became very popular from the 1960s even though their existence can be traced back to more than 100 years earlier. They were adopted by sports teams as a main means of advertising. This was done through creating bobbinghead doll characters of individual team members and financiers as well as using these items in their logos. Food companies also joined this trend later thereby making these items prominent to date. A characteristic nodder is made up of either plastic, ceramic, cotton or both. When representing a human character, the head is usually attached to the trunk through a spring which makes it wobble when touched. At other times, the legs and arms can also be made this way; even though many people prefer a solid connection for these. Either the head or the hands can assume a larger than normal proportion to the body to advance a certain idea or just for the sake of it. You can also express and enhance your creativity through this method. If you have a business that you would like to make known; or an upcoming event that should be made more fun and memorable, these toys can do just that. There are many wobbler customizers that are willing and able to make the perfect one for you. Now more than ever, bobblehead creators are sharper and more imaginative than ever before. This, together with your own creativity, can be put together to achieve just what you need. One has the freedom to pick their favorite color variation, material and other different features that they want included to get the perfect outcome. This entry was posted in Custom bobbleheads on January 20, 2015 by admin. bobbleheads have been around for over a century. Initially focused on sporting celebrities in the early years when they came to light, this has drastically changed over the recent years as more people are got up with the love of bobbleheads. A key improvement in this sector has been more people opting for personalized bobbleheads over the generic ones that have already been made and put to display. We have sought to check out why this trend is on the rise. Personalized bobbleheads depict certain likes and creatures specific to people’s desires. While those on the counter may be generated based on general preferences, getting personalized bobblehead dolls allows for greater sway on what exactly needs to be included. Such people have a choice on the specific character that they want the bobblehead to represent, allowing for a more lenient doll that goes hand in hand with their specific requirements and desires. The varied taste of designs is another major plus for personalized bobbleheads. This kind of dolls are open to various artistic designs that blend well with need be included in them. Persons seeking out for a test of uniqueness are as well catered for with this kind of dolls since their input is the ultimate decision for the operation. Since bobbleheads are meant to display certain values that are keenly embedded in the lives of their owners, these form of bobbleheads provides the right avenue to bring such virtues to light. One may choose on a specific category of dolls and have them marshaled up in their enclosures to communicate specific information about them. Such information may not be clearly captured in the general section and any alterations needed will place you in line with your specific desires. The personalized section will also allow you to blend the dolls with the background setting so you get an ambient atmosphere that you need. This entry was posted in Custom bobbleheads on January 19, 2015 by admin. Creativity has never been short of generating something new and exciting. With the advancing technology, if you need to make yourself into a bobblehead can as well pursue that path without much difficulty. Here is a simple guide for producing your own bobblehead using 3D technology. Simply shoot your photo using a 3D capable device. 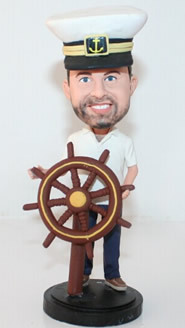 This allows you to capture your own image in the best moments depicting what you want to appear on the bobblehead. Next on line involves going through a refining process to ensure the image suits particularly what you wanted to make. This is probably the longest process since it impacts on the final output. Downloading 3D software can help you do this task more easily. All the edges need to be adjusted to fit and ensure all lines and thicknesses are proportional. Such software will usually provide a range of tools to maneuver through editing your image more easily. Since we are more concerned of the head, it is easier to focus around areas above the shoulders for most of our cleaning program to get a perfect product. All possible transformations centered on the head are performed at this stage until we get a perfect image of what should be used on the printout. Once the editing process is complete all you need to do in the next step is get a printout of the image using a 3D printer. In the vent that there are no resources for such a 3D printout you may upload the image to the site of any 3D printing company to process you a print out. Once the printout is out all you have to do is to assemble the various printed parts and fix it on a base and there you have yourself transformed into a bobblehead! This entry was posted in Custom bobbleheads on January 16, 2015 by admin. bobbleheads have come to establish themselves as the love of many. With various custom bobbleheads now on offer, spotting the right one for yourself can be a tricky undertaking. A good bobblehead must not be only unique but satiate every other intention that need to meet. Here is a simple guide to follow in choosing custom bobbleheads. The specific reflection of the bobblehead must well fit not your set of interests and desires. Custom bobbleheads are there to be a source of beauty and imagination and thus a niche selected should be in line with your specific interests. Whether you have the love of animals, the military or politics, you need to go down and pick out a specific character that makes you happy to look at. This is the first principle in achieving self-satisfaction. The material of the bobblehead will obviously add up to the list of things to consider. Though the early forms of these dolls relied on ceramic as a primary raw material, today’s bobbles tap into a wide range of materials for the final product including plastic, metal and others. If you have no love for metals then you should go for plastic or other alternatives that make you comfortable. The different materials will also play part in determining the final price and thus having a formed mind is important to achieving the best. This entry was posted in Custom bobbleheads on January 15, 2015 by admin. Every time you turn around, it seems someone is having a birthday. It happens all year long and with that it comes with trying to find a birthday present that fits that person. Getting someone an impersonal birthday gift is not the way to go. It doesn’t show thought on your part or that you truly know the person. You need a gift that will wow them and show them that you care. 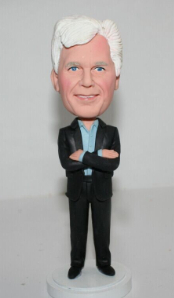 One gift that is becoming increasingly popular is the custom bobblehead. No matter who you are birthday shopping for, you can find the perfect bobblehead for them. It shows them that you know them, care for them, and went that extra mile to make sure you got them a special birthday present. Friends and family alike will love customized bobbleheads. They will love opening that present expecting something generalized and find a bobblehead that looks just like them! They will love it. You are sure to get a laugh as they make their own little head bob back and forth. They will want to show everyone this unique birthday gift. Personalizing a gift can add that special something and make your gift stand out above the rest. It will be a present that will never be re-gifted, thrown away, or tossed out for a garage sale. Maybe the person you are buying for is more into the love of their life. You can have a custom bobblehead made of that person or better yet, of the two of them together. All it takes is a picture and you have the perfect present to light up their eyes and smile. 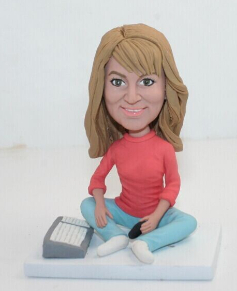 Many friends will not set their custom bobblehead at home, but put it at work to show it off. This is how you know you have hit the jackpot and made that person extremely happy and you scored with a very personal and unique birthday gift. It will bring years of smiles to whomever you give this gift to. This entry was posted in Custom bobbleheads on January 5, 2015 by admin.